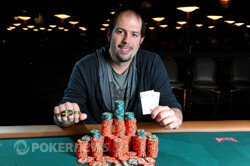 Congratulations to Harrison Wilder ($205,065), WSOP Event #6 Champion! There could be no bigger smile in the room right now than that of Harrison Wilder, who as we speak is posing for his winner's photo alongside his proud parents, Tony and Dee Dee. The Wilder family moved out here to Las Vegas from Portland, Orgeon only three weeks ago to escape to a warmer climate, but now Harrison's "making it rain" as the 2011 WSOP Event #6 champion! It was a stellar performance from the 29-year-old professional poker player, who came to this final table third in chips and managed to hold it all together, despite the massive swings between all ten players. Californian accountant Timothy Chauser was the first to depart in 10th place when despite pairing his on the flop, Scott Clements' was best. However, Clements was the next to go in ninth; after being crippled in an earlier hand, the man they call "Big Risky" got the last of his money in preflop with but failed to improve against William Davis' . Mitch Schock then followed in eighth place; the North Dakota family man moved all-in for the last of his chips with on a flop that read , but Thomas Jamieson outdrew him with . Craig Laben was then sent to the rail in seventh - having grinded his short stack for most of the final table, he finally succumbed to John Myung when he moved all-in preflop with , only to run into Myung's . New Jersey native Sean Nguyen then went through a massive downswing after dinner before losing the last of his chips to Matthew Elsby. The 24-year-old moved all-in on the turn on a board that read with , but ran into Elsby's . And even though taking out Nguyen put him into the chip lead, it didn't last long for Elsby, who eventually fell to Thomas Jamieson in fifth place when his failed to improve against Jamieson's despite hitting the nut flush draw on the flop. 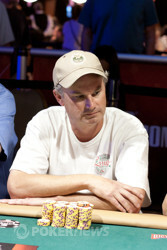 William Davis, who started the day as the overall chipleader, then departed in fourth place when Wilder's outdrew his . 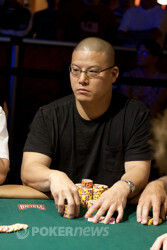 And although Wilder was crippled shortly after that, he was able to compose himself rebuild before eventually taking out Myung in third place when his outdrew Myung's on the turn, taking a commanding chip lead into the heads-up battle against Jamieson. And just after 12.30am local time, it was all over, with Wilder's holding up against the of Jamieson all the way down the board of . Congratulations Harrison for a wonderful victory - and if they happen to change the Main Event to Limit Hold'em we'll see you there! That's all we have time for tonight here at the Rio All-Suite Hotel & Casino in Las Vegas, Nevada. Be sure to join us again from 12pm tomorrow afternoon (GMT -7) as PokerNews continues its coverage of the 42nd Annual World Series of Poker. Until then, stay classy, and thanks for stopping by! Thomas Jamieson Eliminated in 2nd Place ($126,654); Harrison Wilder Wins! Harrison Wilder took commend in heads-up play against Thomas Jamieson. Wilder raised from the button and Jamieson called. The flop came out . Jamieson checked, Wilder bet, Jamieson raised, and Wilder called. The turn ran out the . Jamieson checked again, Wilder bet, Jamieson raised, and Wilder called. The river came the and this time Jamieson led out and Wilder called. Jamieson flipped up and Wilder showed the winner, . In the final hand of play Wilder opened with a raise, Jamieson re-reaised, and Wilder pushed Jamieson all in for his remaining chips pre flop. Wilder pumped his fist in celebration and shook hands with Jamieson. Jamieson then walked up to the tournament director and asked "Where can I get my money?" We are now heads-up for the bracelet after Harrison Wilder first crippled and then crushed John Myung in third place! Earlier, Wilder raised from the button and Thomas Jamieson folded his small blind before Myung called to go heads-up to a flop of . Myung then check-called Wilder after the flop, as well as on the turn of the and the river . Wilder tabled and Myung mucked, leaving himself with just 220,000. A short time later, Jamieson raised from the button before the flop, but Myung reraised from the small blind. Wilder called from the big blind, as did Jamieson to make it a family pot into the flop of . Myung led out and both Wilder and Jamieson called, so it was off to the turn of the . Needing an ace to stay alive, the river was the and Myung was sent to the rail. Ladies and germs, it's time to decide our champion! There has been quite a lot of hands between these last three players; in fact, it's safe to say that this is probably one of the most aggressive Limit Hold'em events we've witnessed in recent years, but the counts are now beginning to even out as a result. Stay tuned folks, we're due to crown our winner soon! John Myung, the short stack at the table raised from the button and Thomas Jamieson called from the big blind. The board ran out . Jamieson checked the flop, Myung bet, Jamieson raised, and Myung called. The turn brought the . Both players checked to the river when the showed up. Jamieson bet and Myung called. Jamieson showed to ship the pot.